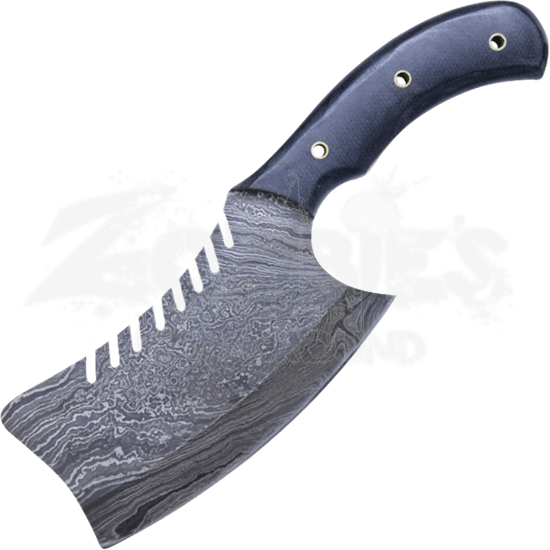 Turn heads the next time you need to chop something with our Serrated Damascus Steel Cleaver Knife. Running the length of this cleaver are unique serrations that make it a distinctive stand-out knife. The Damascus steel that this knife is crafted from has been folded several times to create 250 layers in the metal which gives it that unique rippled effect. The blade is shaped like a traditional meat cleaver with no point and a gently curved edge. Included with this knife is a brown leather sheath offering easy access and transportation. For someone with an eye for detail, this cleaver is the perfect addition to a kit or collection of knives. This cleaver is more than just an attractive knife. It features a durable, hefty design, which makes it an effective chopper for camping and competition.